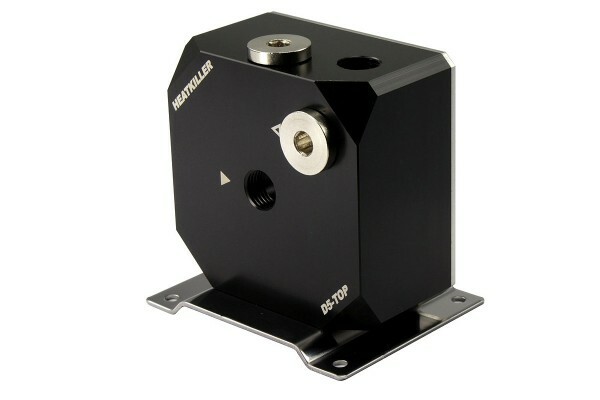 The HEATKILLER® D5-TOP is the perfect add-on for D5 pumps. Four G ¼“ threads allow for easy integration into the cooling loop with all common fittings. Non-used threads can be sealed with the included plugs. Hydro-dynamically optimised channels make the pump work more efficient than with the original top. A stainless steel mounting plate is included. This can be installed with a 90° variation as well, which makes mounting easy even in narrow PC cases. Alternatively, the plate can serve as a supporting base. A decoupling component made from rubber is separately available. As for material, we use high-quality POM and manufacture the plates from polished stainless steel. Please note: Pump and fittings are not included. Will this work with Alphacool Eispumpe VPP755? Yes it works, but please use the O-ring from the VPP755 not from the Heeatkiller Top. Hello. Is the O-ring included in the package? if not, what size is needed? Passt da auch die aquacomputer d5 usb Version drauf ? Ja. An dieses Top passen alle D5 Pumpen. Posso montare questo top su un heatkiller tube 150 d5? Ciao, sfortunatamente questo non è possibile. "Träger" für die D5 Pumpe ist sehr gut und passgenau verarbeitet! Dichtung über O-Ringe auch nach Jahren noch Dicht! Fittinge lassen sich gut einschrauben! Sehr gutes Produkt und auch wieder schnelle Lieferung!